Paris - Kylian Mbappe scored one and set up two more as France routed Iceland 4-0 at the Stade de France on Monday night to move to the top of Group H in Euro 2020 qualifying. "It was our objective to take six points but the manner was good as well," France manager Didier Deschamps told the post-match press conference. Deschamps praised his team's "offensive efficiency" against a "dense" Icelandic defence. "When the opponent plays very defensively it can be very difficult to find a way through so that was a good sign," said Deschamps, although he acknowledged that Icelandic fatigue near the end played a role. He added that he was pleased that all three strikers - Mbappe, Antoine Griezmann and Oivier Giroud - scored. "They are the champions of the world and you saw that today," acknowledged Iceland manager Erik Hamren. "Five shots on goal and they scored four. 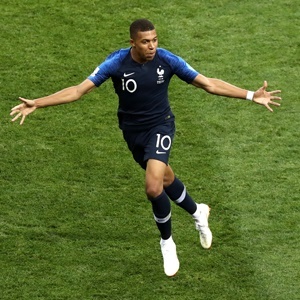 That's top class"
From the start Mbappe's movement mesmerised the Icelanders, though his contribution to the opening goal after 11 minutes was straightforward. "He's not playing much for his club," said Deschamps. "But he remains effective and brings something different to the other two strikers." "As long as its 1-0 we have a chance, but after 2-0 we had problems," Hamren said. "We've started well with two nice team performances" Paul Pogba told French broadcster M6. "We knew what we were up against. They are a team that doesn't let in a lot of goals but today we did our job." Pogba warned that the world champions are improving: "I think that we've made progress. We gained experience with the World Cup." France's next game is away to Turkey on June 8. On the same evening Iceland host Albania. "We're not yet qualified and the next game against our friends the Turks will be hot," Deschamps warned.